The World’s largest Harley Davidson Dealership Bruce Rossmeyer’s and the World Famous Daytona Beach Main Street will host the area’s first International Female Ride Day Event for female motorcycle enthusiasts. 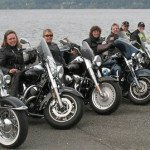 The International Female Ride Day, founded by Vicki Gray of MOTORESS in 2007, will begin its first annual celebration in the Volusia County area on May 2nd, 2008. Beginning at 6:30pm, Bruce Rossmeyer’s Destination Daytona in Ormond Beach, FL, will hold a safety seminar, fashion show, bike contest, raffles, give-aways live entertainment and the Daytona Harley Davidson Drill Team will perform. From Destination Daytona, a police escorted Moonlight Ride will leave at 9:00pm, travelling to Main Street via the Main Street Bridge for attractions, live entertainment, food and activities. Attendees can register to win a three day/two night weekend getaway. The first 250 women riders participating in the Moonlight Ride will receive Welcome Bags upon their arrival. More than 10 bars and restaurants on Main Street will be open for celebration into the night. Arranged by Michaela Brunmeier of Image Makers Advertising and Tanya Stiffler and Heather Wright of The Biker Guide™, the first 250 riders will also receive a commemorative magazine. Coverage of the event will be posted on The Biker Guide’s website along with pictures submitted by the participants. Bruce Rossmeyer’s Destination Daytona, known as the World’s Largest Harley Davidson Dealership, is an all-inclusive event facility. The 150-acre Destination Daytona Attraction is home to live concerts, top industry vendors, restaurants, food court, pubs, speciality shops, hotels and the new 35,000 square foot Coca Cola Event Pavilion. Image Makers Advertising, LLC located in Daytona Beach, FL, is responsible for the brand development, public relations, advertising, electronic media, collateral design and research for an array of well known companies both large and small. Along with branding and promotion of corporations, Image Makers also facilitates in the planning of community wide events. The Biker Guide™ is a quarterly publication catering to all types of motorcycle and tattoo enthusiasts with a strong focus on promoting business women in the industry, as well as women who ride. Publishers, Tanya Stiffler and Heather Wright launched the first edition of The Biker Guide™ during Bike Week 2007 in Daytona Beach and quickly expanded into two regional offices in Daytona Beach, FL and Houston, TX.